Jagged 1 antibody LS-C18929 is an unconjugated rabbit polyclonal antibody to Jagged 1 (JAG1) from human and mouse. Validated for ELISA, IF, IHC and WB. 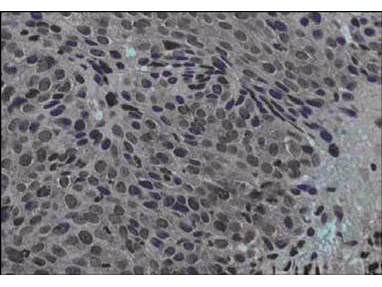 JAG1 / Jagged 1 antibody was raised against synthetic peptide from human JAG1 / Jagged 1. Amino acids 110-125 of human Jagged-1protein. This protein A purified antibody has been tested for use in ELISA, immunohistochemistry, immunofluorescence microscopy and western blot. Specific conditions for reactivity should be optimized by the end user. Expect a band approximately 150 kD in size corresponding to Jagged-1 in mouse liver whole cell lysates, and a 75 kD band in human brain and kidney lysates. 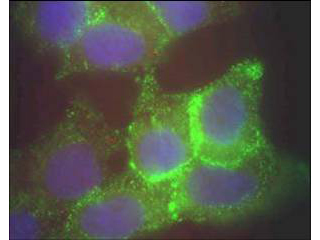 Immunofluorescence - Jagged-1 Antibody. Immunofluorescence microscopy using Protein A purified anti-Jagged-1 antibody of human corneal epithelial cells. 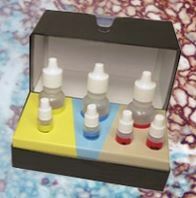 Primary antibody was used at a 1:500 dilution. The Jagged1 (green staining) is localized to the cytoplasm and is consistent with reports in the literature. The nucleus is stained with Bis benzimide (blue). Personal Communication. Aihua Ma, Univdersity of Cardiff. 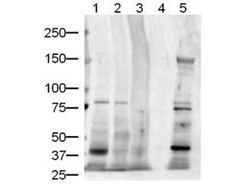 Anti-Jagged-1 Antibody - Western Blot. Western blot of Protein A purified anti-Jagged-1 antibody shows detection of Jagged-1 protein in various whole cell lysates: human brain (lane 1), human kidney (lane 2), human liver (lane 3), and mouse liver (lane 5). Lane 4 contained sample buffer only. The band at ~134 kD in lane 5 is believed to be Jagged-1 precursor. The identity of minor reactive bands is unknown. Each lane contains approximately 20 ug of lysate. Primary antibody was used at a 1:500 dilution. The membrane was washed and reacted with a 1:5000 dilution of HRP conjugated Gt-a-Rabbit IgG. Exposure time was 1 min. Predicted molecular weight is 134 kD.